Bam! You are just about ready to venture into Part III of my bootstrapped software series! A couple of months ago I began documenting the process that I followed to launch and grow my software product, Long Tail Pro. I've had tremendous success with that business, but it hasn't been easy. I've been a bootstrapped entrepreneur from the beginning and started with no audience or list. However, I've learned quite a bit over the years, and this series about how to launch a bootstrapped software business will hopefully help you in your journey. I highly recommend that you read the other posts in the series before going through this one entirely. Okay, now that you are all caught up with the bootstrap software series, let's dive into how to launch your software! When you first create your product, hopefully you've already done your market research. If not, you could be in a world of hurt when you try to sell your software! Even if you have done your market research, it's very possible that you don't have a large email list or active audience at your disposal just yet. Don't worry though…you can still generate some sales! Today I want to walk through the specifics of how you can take a LEAN approach to marketing your software, even if you don't have a large audience. There are obviously a lot of benefits to having an audience (email list) before you launch, but that isn't a luxury that all startups have. When I launched Long Tail Pro, I only had a small email list of about 1,000 subscribers. It wasn't big, but it was enough for me to get some initial beta testers and feedback. Launch to your own email list first (if you have one). Find active communities where you can sell your product (like the Warrior Forum for example). Find a JV partner that DOES have some influence and make a deal. In general, these 4 strategies will help you get your product out the door initially and allow you to better test the market for a rather small sum of money. (In my next post, I'll talk more about long term marketing strategies). And if you've built a small enough version of your software (one without all the bells and whistles), you can take a truly lean approach to building, testing, and selling to verify that the market wants what you really have. I've been reading the 7 Day Startup by Dan Norris recently, and find myself agreeing with most of what he says in the book. Yes, 7 days is a short amount of time to launch a business, but I think the principles are valid there for a true bootstrapper. Build and test your idea in the market as quickly as possible without breaking the bank, and then grow the business as you start to get some traction. Hopefully, some of my thoughts below on launching and marketing your software product on the cheap, can help you along in your ventures. I think the best way to learn is through story and examples, so I hope you don't mind as I share a bit more of the story of how I launched Long Tail Pro. As explained above, I did have a small email list which allowed me to get some initial testing and sales. I basically wrote a few emails leading up to the day that I was going to “open the cart”, and just let people know when they could buy. I had of course primed my list by releasing a couple of videos and testimonials from early beta testers. I launched to my email list first, but I actually ALSO launched on the Warrior Forum a short time later. This process seemed to work fine for me. I knew that the Warrior Forum was a large community of people that fit perfectly in with my target market of people doing SEO and keyword research. 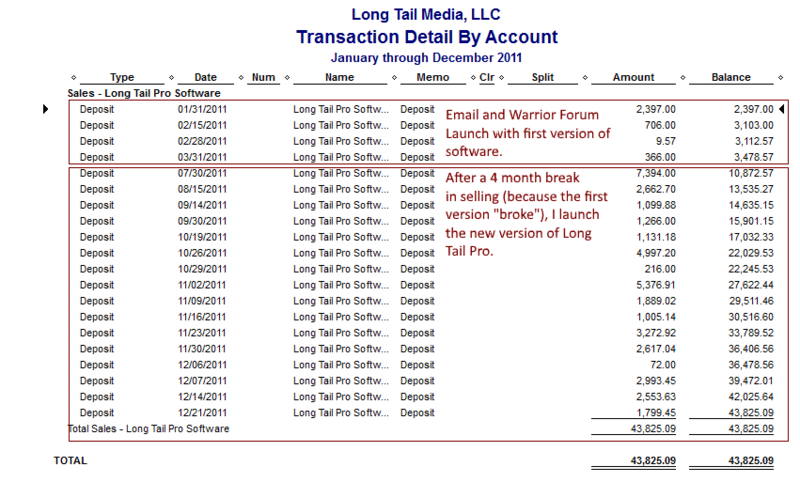 As a result, I figured I could list Long Tail Pro on the Warrior Special Offer page (I think it cost me $37 to list), and potentially get some natural sales from the Warrior Forum as well. In fact, I was able to go back and find that original special offer page here…it's still up! I know its not pretty, but you don't need pretty to test the market. If you can get a few buyers when it's ugly, just imagine what you can do once you put some design effort into it? When I launched on the Warrior Forum, I didn't make a TON of money, but I did make back my $3,000 or so invested up to that point. And when I say “launch” on the Warrior Forum, I literally just posted the special offer and emailed my list, that was it. (No affiliates, partners, or anything). As you can see from the screenshot, I made just about $3,500 by launching to my first small email list and on the Warrior Forum. I made a profit of about $500 after development and other small costs! If you read my last update, you know that the software then “broke” quickly and I had to stop selling. This is why there is a 4 month gap from March to July of 2011 with no revenue. I felt like that $3500 had validated the market well enough for me that I should go back and invest another $15,000 into building out a MUCH better version of the software. That 4 month break was pretty nerve wracking. I was pretty sure it would sell, but you have no idea until you launch (or re-launch in my case). In addition, I had also just quit my job on March 11th, 2011! It was a stressful, but happy time. Luckily, I was making a nice six figure a year income from my niche sites, so the Long Tail Pro income was bonus money. So, Long Tail Pro made $43,825 in revenue during it's first year of operation. I was pretty darn happy with that. I am not going to share the income of the business right now, but obviously things have gotten much better since then. In 2012, the revenue over doubled what it did in 2011. In 2013, the revenue over tripled what it did in 2012. In 2014 and 2015 the revenue continues to have a nice increase year over year (I won't share how much to keep at least a little bit of privacy 🙂 ). Overall, the business has been very good for me in terms of revenue and profits. However, it all started with that little launch I did to my email list and on the Warrior Forum. That small market validation of $3,500 in sales really helped me buckle down and grow the business. Early on in my business, I didn't do any special promotions with an official JV partner. I think for people just starting out, this could be a huge avenue to success and it shouldn't cost you anything up front. So, what is a JV partner? A joint venture partner is someone that can bring buyers to your offering. In exchange, you might offer them 50% commissions on any sales they bring in the door. This is a little bit different (at least in my opinion) than a standard affiliate. For example, you might partner with someone to actually go out and recruit a bunch of affiliates for you. In addition, this partner would likely promote to their own list as well. This person would work with you to put together a one-time big launch where they do all the recruiting and sales strategy. So, you don't pay them anything up front, but you pay them some percentage of sales that they bring in. I really like this strategy of working with a JV partner because it cheap up front (bootstrap! ), and can still help you get on the map. My business was almost 2 years old before I figured out the whole JV partner thing. I went out and connected someone that would recruit affiliates and put together a big special offer for me. I just had to make sure the software was working and had a support team in place. I actually wrote about this big launch I did in early 2013 with Mark Thompson (the JV partner I worked with). We agreed that he would get a % of sales that came through just his channel (not a % ownership of the overall business). That launch was up for about a month. The results? Well, as explained in a previous post, that launch brought in $261,225 in sales in just 20 days. (My actual income was less after my split with JV partner and affiliate payments). This JV partner launch is a big reason why the income of Long Tail Pro was about 3 times higher in 2013 than in 2012. I also made a couple of other tweaks in 2013 that lead to higher revenue as well (including adding a monthly platinum subscription option). In addition, I just finished up doing another big JV launch in July of this year (2015). The results were significantly larger than the launch we did in 2013. So, all I can say is that if you can find someone in your market that is willing to partner up and help you recruit and bring in sales, it's totally worth it to pay them a healthy commission. I also believe that this can be done in just about any market, not just the SEO/keyword research niche. Separate from working with a JV partner, you should be out recruiting affiliates on your own. I actually started doing this fairly early on with Long Tail Pro. I was an active blogger before I ever created the software, so I had a few connections already. However, I continued to blog and reach out to others in the community in hopes that they would mention Long Tail Pro. I was able to get people like Chris Guthrie, Empire Flippers, and Pat Flynn on board pretty early on after launching my “new version”. These are all people I had connected with I think even before Long Tail Pro existed, so it was a pretty natural transition to mention the software I had just created. However, even if you don't have those existing connections, you should start right away! If you are in a market that you genuinely care about, it really isn't that hard to interact with other bloggers in your space. Don't be afraid to offer a special discount or an exclusive bonus to make it easier for bigger affiliates to join your “team”. You just need a little bit of hustle and you can start making those connections. Especially if your software actually meets a need in the marketplace, people will be happy to mention it to their list. When you are bootstrapping and don't have some huge marketing budget, you have to replace money with hustle and time. There definitely is a path to success without lots of money. I was able to make genuine connections with lots of people through my own efforts (no money spent), and I know lots of other people that have done the same thing. Yep, it takes work…but it can totally be worth it. I think it goes without saying, but if are early on in your business and just trying to get something out the door, there is no need to break the bank on a fancy website or other graphic design. You can (and should) go back once you've validated your idea with something that looks more “slick”. When I launched Long Tail Pro, I went over to ElegantThemes.com and got a good looking theme for around $50. I then wrote all the sales copy myself, recorded my own demo videos (using a free screen capture software and youtube), and set everything up in WordPress because its free. I then hired someone to create a logo and design a software box image for me. The logo and box only cost me around $50 as well, maybe $50 each…not sure. Overall, I spent about $150 getting my complete website up and running, logo, and other designs. No, they weren't real pretty or amazing. But they were good enough to make some sales. That's all you need! So, if you are spending thousands of dollars getting a professional website designed and logo created, you are over-spending in my opinion if you haven't even launched your product yet. Once you've sold your product for a few months and know you have a winner, THEN go back and splurge on a nice design. Logos: Freelancer.com (I manage to find great logos for really cheap here). You can also try Fiverr.com, Upwork.com, or 99designs. Videos: Fiverr.com (for short splash intros), Powtoon.com (free animated videos), Cam Studio (free screen capture software). Overall, you can get some fairly good looking images, web designs, and videos for quite cheap. If you are just in the early stages testing out an idea, I think this is the way to go. Overall, I hope you found some of my tips for bootstrapping the launch of your software product useful! There are so many creative ways that you can go about marketing your software, and I've just shared a few here. 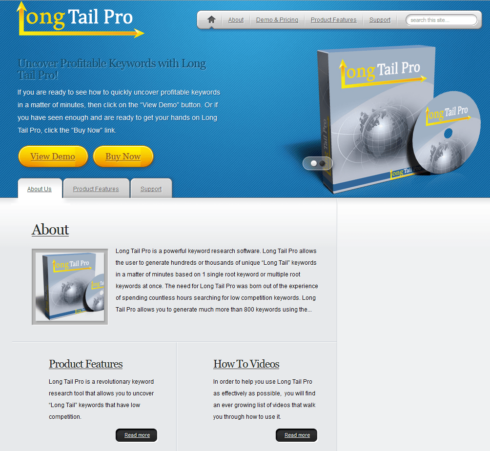 With Long Tail Pro, I was able to do well using my small email list, active communities, and with JVs and affiliates. Up next, I will discuss more long term marketing strategies that can be accomplished on a budget. As always, I would love to hear your thoughts…so feel free to continue the discussion below! Out of curiosity what programming language / platform is the current version of software built upon? This is a very nice post. 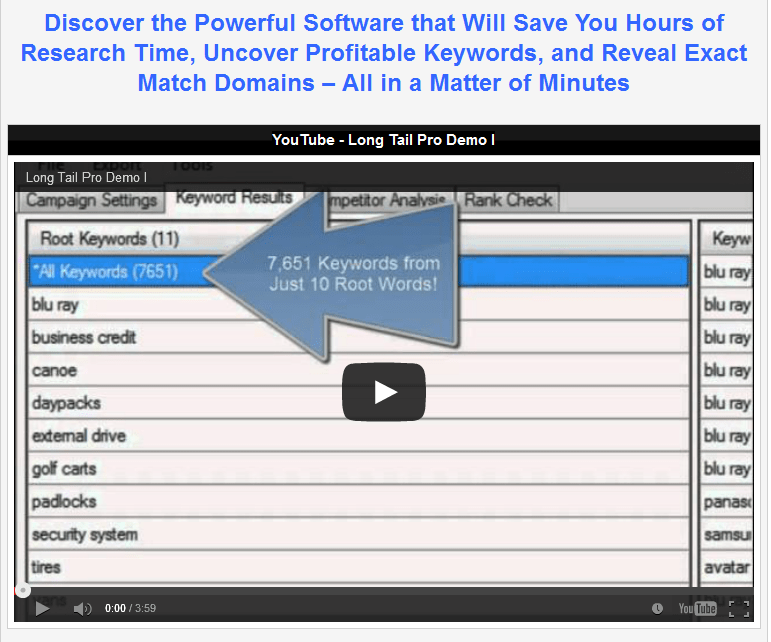 Long Tail Pro has really come a very long way and i remembered when i first read about it on Pat Flynn’s blog, i started desiring it from that day until the day i finally purchased it. You really put a lot of work into that software and its good to see that it is paying off tremendously now judging by how popular it has become overtime. I agree with the idea of first introducing your new products to your small email list, this will really help you to get the first complains and suggestions about the product from people you’re already somehow connected to before finally taking it out to the market. I don’t have a software business ,but a sharpening business, scissors, knives. Can you give examples other than a software business. I purchased LongTail Pro for hopefully building a niche or authority website, but I am in over my head, so much I don’t know. I think these strategies can work in any market; look for active communities in your niche. Hey Spencer, great article mate thanks for the mention! Thanks Dan! Really enjoyed your book. Fact is that you normally don’t create something totally new. There are already analogs, which r more expensive but very alike, or much chieper but don’t work. So I mean you have to show and explain your creation in this reality, where you are NOT ALONE. And the question is how. The question in generally is how to represent something tech to the market of clients who are not so tech people often. So that presentation is appealing and understandable to those “normal” people. May be you have some hints on this too) Thanks a lot! Thank you for another insightful article! JV Partners? Never thought of that. So how would you go about finding a JV partner without any connections already established? That’s the problem I am running into right now, starting out trying to bootstrap this new piece of software, totally green with practically zero connections. You talked about the ‘hustle’, would that include cold calling (emailing) others in the industry with the offer of the partnership? You might be surprised at who will respond to your genuine requests. As you get more and more involved with your target market, you are likely to make more connections. Keep contacting people, it takes work…but you will get responses. Yes, I mean cold calls, or “cold” emails. Blog comments, forum posts, etc. thanks for your sharing, I’ll purchase a LongTail Pro soon . licensing and security is very important in your software. Even then, you will likely face piracy issues. A good developer can help you work through the security issues.